Letters to Elijah: Rerun: Does frugal = cheap? Call me lazy... but this holiday week is all about vacation. I'm going to rerun some old favorite posts. Enjoy! I used to always think frugal and cheap were the same thing. That is until recently. When I looked up cheep in the dictionary it also said to see stingy, sleazy and tawdry. Ouch! When I looked up frugal in the dictionary it also said to see sparing, economical and thrifty. That's better! The other day I was in one of the places I hate to be - Walmart. In general, I think they sell a lot of cheap stuff - not frugal, cheap. I had to buy rubbermaid style containers for my step son. 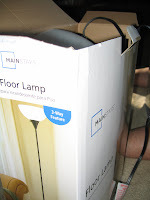 (He is off to boot camp in 2 weeks and needs to store his stuff) While in Walmart I saw a floor lamp (my husband has been wanting a pair for some time now) It was exactly the style he wanted - and the price I was wanted to pay. They were $7.50 each. Sound too good to be true? turns out, yes. When I got home I was excited to assemble them. There were a series of tubes that needed to be threaded together. Problem was, they didn't thread that well - and if you didn't do it right the first time you ripped the threads then the lamp didn't stand straight. I packaged the lamps up and took them back to Walmart. They happily took them back. It's like they knew I was coming back. So here is my question for you. How do you know know when you are getting a good deal vs getting what you pay for? Are you cheap or are you frugal?